I am addicted to this miso-based dressing. It goes with everything, and I always keep a jar of this ready for salads. 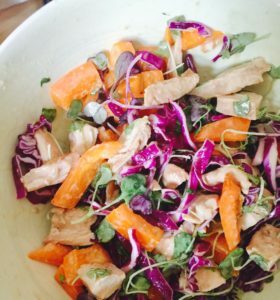 The photo shows a salad I made by tossing the dressing with red cabbage, orange peppers, microgreen mix and grilled chicken.